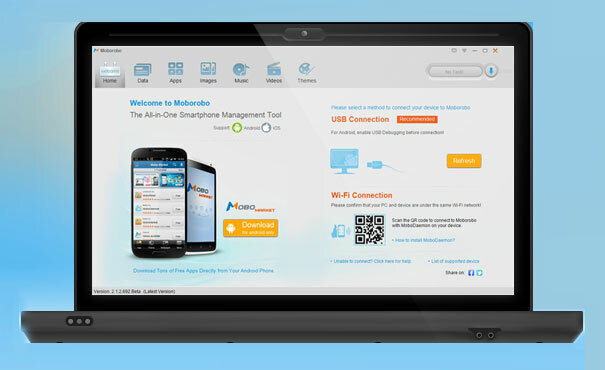 MoboRobo is a free PC Management Suite that lets you access your iPhone or Android Smartphone and tablets as well, from a Windows PC. 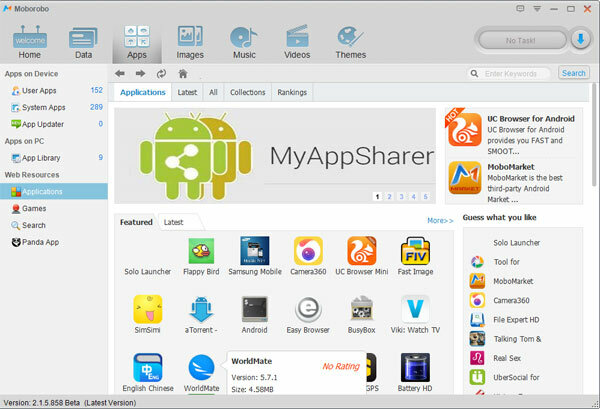 It enables you to send and receive text messages, manage media files like photos, songs, and videos and even install apps to android or iPhone directly from the computer without having to use the device itself. Though the initial setup might be confusing at times but it works quite well after certain procedures are completed. In order to take the advantage of this software, the device that is going to be connected needs to have a companion app installed that allows the device to be synchronized with the computer. After installation, you will need the device and the computer to be connected to the same WIFI network or via USB with minimum setting to follow. Connecting through WIFI is the easier of the two. You just need to scan a QR code and if the connection is established, the device will vibrate. In order to connect the device via USB, developer permission must be granted on the phone. Then the phone’s respective drivers must be downloaded and installed on the computer. These drivers are readily available in MoboRobo official website. Note that Windows might flag the files as suspicious but it is nevertheless 100% secure. After completion, the device and computer is totally in sync. The interface is very easy to use and requires very little effort to understand. The most appealing feature of MoboRobo is its ability to send and receive text messages directly from a Windows computer. In a hectic schedule, typing on the small mobile display can be difficult and frustrating. Thus, MoboRobo allows you to use the full sized keyboard to send and receive messages without needing to even touch the phone. Most of us have hundreds of contacts in our phone and it is quite an unwieldy task to create those many contacts in a new phone (if any). This is when MoboRobo truly shines. It is among the first cross-platform remote application that lets you transfer contacts from iPhone or Android device to the PC. 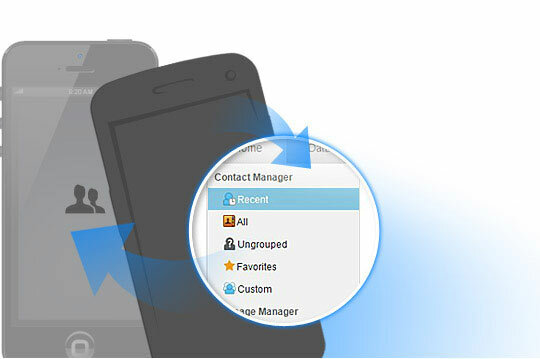 Moreover, it also lets you transfer contacts in between iPhones or Android Smartphone or tablets directly. Want interesting SMS threads or important images to be in a secure place that can be accessed whenever needed? 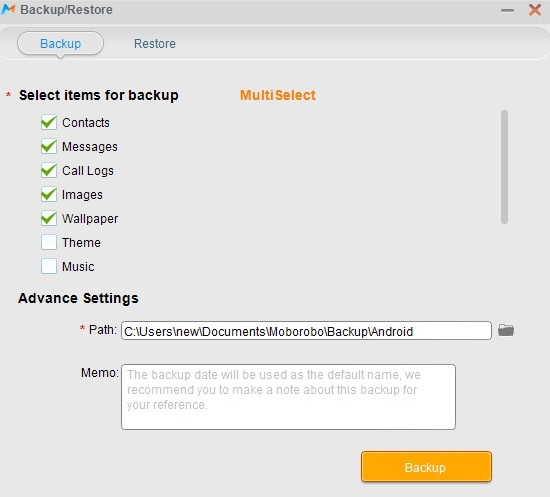 MoboRobo allows you to take backup of the files and contacts stored in your Smartphone or tablet in a simple and intuitive manner so that recovery of important information can be done without any hassle. Backups can also be taken of messages, call logs, pictures and even application data. Not only is the interface simple but it is also feature rich. Various tabs are included to make file management easy and fast. For e.g. if you want to manage your pictures, click on the images tab where you can transfer image files and edit them. The same goes for music as well as videos. Apart from all the cool features that MoboRobo provides, there are tons of other goodies that can be downloaded from the Mobo market such as latest and popular games, e-book reader and media player with support for all formats along with a very distinct looking launcher for Android with numerous transition effects, tap effects, unique widgets, battery management tool and what not. The MoboRobo PC Suite is constantly updated with the aim of fixing bugs and adding new features in the already feature-rich application. And you don’t even need to pay for any of these stuffs. Just download, install and enjoy your simpler new life. Previous: Flipkart – What’s Going On These Days?